I just got back the photos from the hall-cosplay-contest shoot we did at Anime Boston. I’ve retouched the photos a little (they came back very dark, so I brightened them up a little) and added them to the Sheik costume page. I’m very excited about how these photos came out. They’re good quality and showcase the costumes well. They’ll also make it easy to photoshop the figures into some awesome backgrounds if I get around to that this summer. I magine this, yesterday as part of a group project, I present research on Cosplay for my Japanese Art history class. For a major grade, my group and I got to research and give a presentation on cosplay!! As you can imagine, it was a very fun topic for me to research. I covered Competition and Etiquette in my portion of the research. A lot of my presentation was drawn from my own experiences, but I did do extra research to look into the World Cosplay Summit as well as to obtain popular opinions on appropriate and inappropriate cosplay and convention behavior. I finally have enough pictures of this costume where I feel I am ready for a critique. I plan to fix up my Sheik costume for Connecticon and future cons to come. If you have any suggestions for me on how I can improve, please leave me a comment on this post or send me an email. I have been attending Anime Boston since its commencement back in 2003. I have never missed a year. Now, I shall attempt to summarize and rate my experiences of this year’s con as compared to Anime Boston year’s past and other cons I’ve attended. 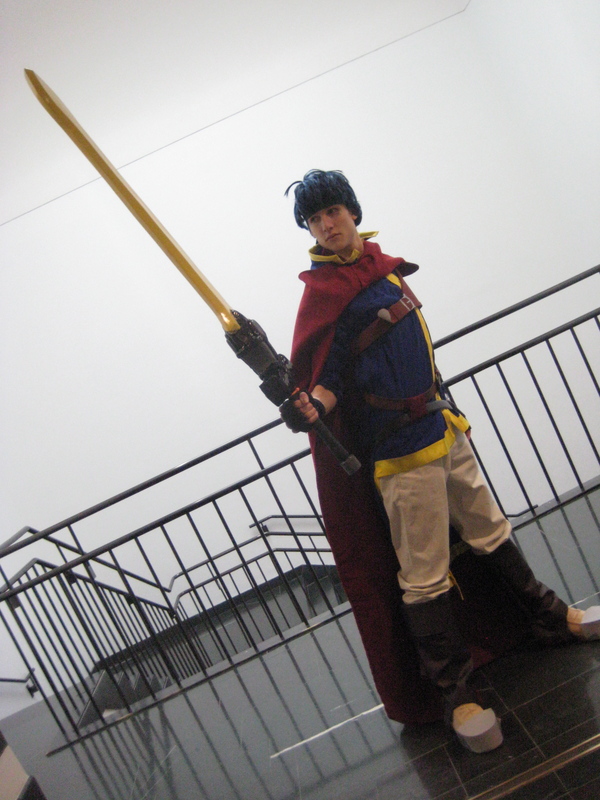 Once again, the Hynes Convention center was a great place to have an anime convention. Big hallways and in a great area of Boston. No complaints about the location. Unfortunately, because the convention came early this year, the courtyard was supposedly not open to the public yet. Normally, the court yard is a beautiful place to take pictures, and even though I did see some pictures from the courtyard posted on the internet after the fact, I was told several times that it was indeed closed. Also, because the convention fell on easter weekend, I was, A) not out of school yet and incredibly busy, which caused a little added stress, and B) I could not attend the convention on Sunday in observance of easter. I imagine it was quite slow on Sunday anyway since it was both Easter and Passover. Boo bad timing. Parking was convenient but expensive! $30 per day. But having a car was a necessity with those costumes and it was right across the street from the convention center which made it easy to go back to the car if we forgot something. No lines–At least I didn’t wait in any. I heard there were lines for some popular panels, and as always, the lines for Main events–especially the masquerade was huge. But I didn’t have to wait in a single line all weekend. So it was quite avoidable. I noticed a strange lack of staffers this time around. Honestly, the only time we had any questions and needed assistance, we got nothing. It was a disaster, in fact. When we first arrived at the convention, we needed to find registration. We asked a staffer where to go. She sent us around the block but didn’t give us a very specific location. She said we’d see the signs. No. We didn’t. Then we got to the Sheraton hotel, where registration was. But we were a floor below it. We asked another staffer, who was not 40 feet from the line, where to go. He sent us back outside. We lapped the block at least twice and spent an entire HOUR looking for the registration line, later to discover that we were practically right next to it when we were sent away. That was really terrible. Overall the staff seemed really stressed out, with the exception of the people running the photo booth. They were great! But everyone else was either not around or totally lost. I know it’s not easy, but the con definitely seemed under staffed. I brought my lunch both days, but I know from past experiences that the food at the Prudential mall, which is connected to the Hynes is pretty good and very convenient. You pay for the convenience though. But what isn’t expensive these days? Mediocre. I could have bought half of the stuff there at Game Stop, Barnes and Nobles, or Hot Topic. Nothing stood out to me as being really special. I didn’t buy anything. The cosplay is what really made the convention for me, as it does every year. Cosplay is honestly, my biggest reason for attending the con. I think that the level of skill exhibited in the halls is really above what you get at other cons. I love dressing up myself and participating in Photoshoots and the like. I think that that whole aspect of the con was a huge success. It was quite an enjoyable spectacle. Overall, I would give Anime Boston 2010 a 4 out of 5. Better than I-con, but not perfect. Because of the hectic scheduling and the time of year that the con fell on, I was exhausted by the end of it. It was a lot of fun attending and of course I will be back next year, but I did expect a little more from my most frequented con. If you’ve never been before, it is definitely worth checking out.